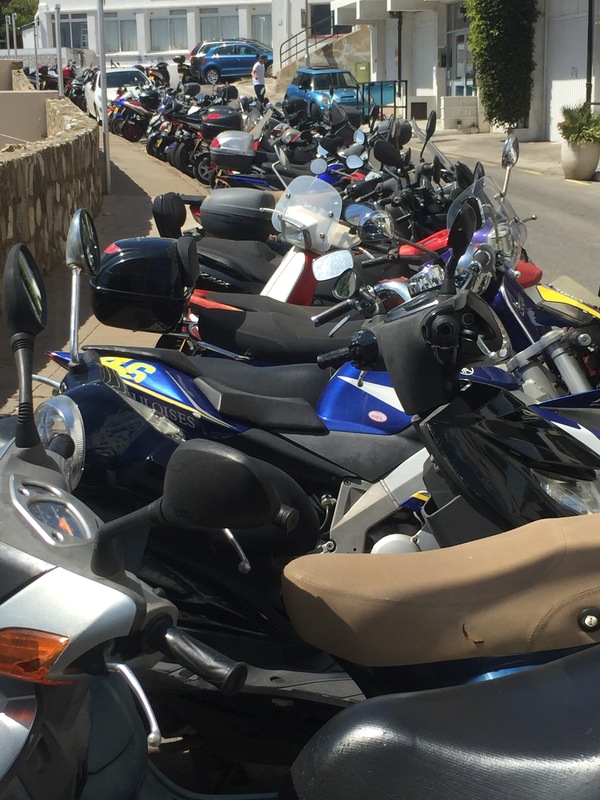 The cycle of choice preferred by the masses in Gibraltar has to be the motorcycle. They are everywhere. Parked in every little scrap of space at the side of roads, even on pavements at times. 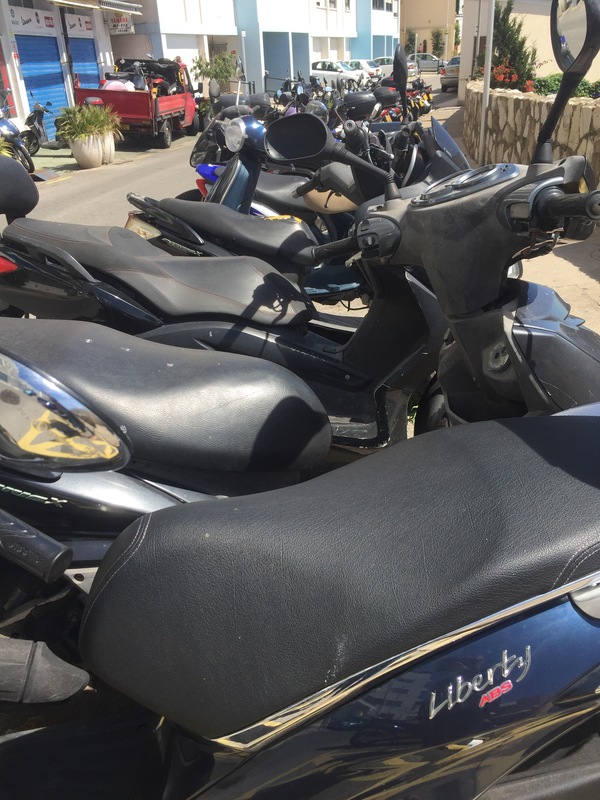 As a pram pushing mother of small children they were the bane of my life, finding myself in the middle of a road with a pram and unable to access the pavement because of a row of motorbikes tightly packed together and parked at right angles to the kerb. I can see the merit of having one though, it takes relatively little space to park, and you can dodge traffic jams pretty effectively. For some motorbike riders though, as they don their helmets they lose all common sense. They speed, overtake and undertake with scant regard for their or any other road user’s safety. I have heard them described as “insects” and it’s such an accurate metaphor, from the noise they make to their swarming habit (especially at traffic lights). I’ve lost count of the number of motorbike accidents I have seen happen here, fortunately they were all minor. Amazingly the riders involved (who are usually young men) appear to walk away from their scrapes relatively unscathed, a few bruises and grazes and perhaps their pride dented. Tragically, though, we are well aware that these accidents can be fatal. 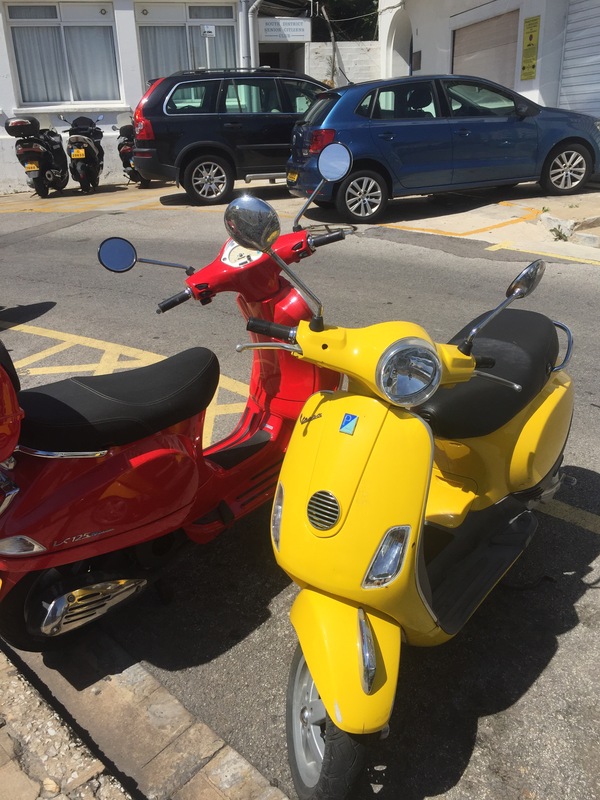 I have to admit, that I do rather like these bright Vespas, but I dread the day one of my boys comes home with one…. Ah the motorcycle years, I remember them well. Two of my sons had a motorbike, useful for the saturday jobs. And yes parked like that they are a thumping nuisance, especially for pushchairs and wheelchairs. I don’t know if my nerves could stand it if they rode them 😕! My brother has ridden a motorbike since he was old enough – and before then he bought old bikes and did them up in a neighbour’s garage. He loves classic British bikes. I know my Mum was horrified at first – I would be really nervous if my own son decided to ride a bike too, like you are. However, my brother has always been the most sensible driver, not slow or geeky, just aware of others and he doesn’t take stupid risks. He also drives a car, when a bike just won’t do – he is actuallya worse driver in a car! I am not a bike fan, they definitely are not for me, but yes those Vespas are cute to look at!